The Brazillian shipbuilding endeavor received a significant financial injection, as OSX Construção Naval entered into contracts with lending agents BNDES – National Development Bank and CEF - Caixa Econômica Federal for financing with resources from the FMM - Merchant Marine Fund, in the approximate amount of $700m each, totaling approximately $1.3b. This $1.3b financing is dedicated to the implementation of the Açu Shipbuilding Unit, the largest shipyard in the Americas, which OSX has been building since July 2011 in the north of the State of Rio de Janeiro, and is scheduled to begin partial operations in the first quarter of 2013. UCN Açu’s order book already includes 16 offshore units for oil and gas production in Brazil. The loan has 252-month tenure (21 years) for both Financial Institutions, with a 42/36-month grace period for amortization of principal and 36/30-month grace period for payment of interest to BNDES and CEF, respectively. The expected average interest rate is US$ + 3.38% p.a., paid monthly with the amortization of principal after the grace period. The Board of Directors of the Merchant Marine Fund approved this financing priority for OSX in June 2011. “The Açu Shipbuilding Unit is an extraordinary tool for the development of oil and gas production in Brazil. The financing obtained from the Merchant Marine Fund reaffirms the strategic importance of its implementation for our country”, said Eike Batista, Chairman of the Company’s Board of Directors. UCN Açu is a 5th generation shipyard with technology provided by partner Hyundai Heavy Industries, the global leader in naval construction, generating over 10,000 direct jobs. Its 2,400 m quay and expandable to 3,525 m may simultaneously integrate up to 11 FPSOs. Located in the Açu Superport Industrial Complex, UCN Açu is strategically positioned at approximately 150 km from the Campos Basin, which is responsible for around 85% of the Brazilian oil production. “The fact that OSX has obtained the most important credit line available to the Brazilian Naval Industry is another significant milestone in our working path towards implementing the largest shipyard in the Americas, bringing on board of this project a team of thousands of Brazilians dedicated to professional qualification, technological conquests and the sustainable development of Brazil”, stated Luiz Eduardo Carneiro, CEO of OSX. The construction of the Açu Shipbuilding Unit in the Açu Super Port Industrial Complex in São João da Barra, located in the north of the State of Rio de Janeiro, has been progressing according to schedule since July 2011, and completion is estimated for the second quarter of 2014. 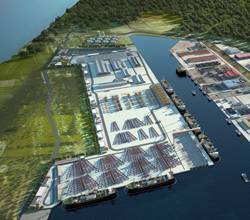 During construction of UCN Açu, partial deliveries of important sections of the shipyard are scheduled to occur, which will allow the Company to begin the partial operation of UCN Açu in the first quarter of 2013. The UCN represents a US$ 1,7 billion investment. Among the competitive advantages are the proximity to major steel mills, thermo power plants and with Campos Basin – responsible for 75% of the country’s oil production –, only 150 km away.